SAN SALVADOR, El Salvador (CNS) — Pope Francis assured the bishops of El Salvador that the sainthood cause of slain Archbishop Oscar Romero was proceeding well, and the bishops asked him to come to El Salvador to preside personally over the archbishop’s hoped-for beatification. 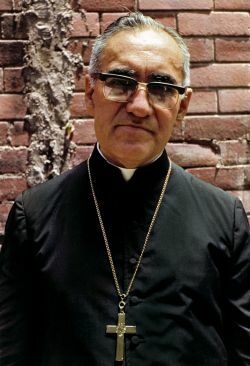 Archbishop Jose Escobar Alas told reporters May 18 that he and three other Salvadoran bishops met the pope at the Vatican May 9 to discuss the cause of Archbishop Romero, who was shot and killed March 24, 1980, as he celebrated Mass in a hospital in San Salvador. “We ask the Lord for the speedy beatification of Archbishop Romero and that the pope come here” to celebrate the ceremony, Archbishop Escobar said. The pope told the Salvadoran bishops that he was pleased the process was moving ahead, but he gave no indication of when it would be completed, the archbishop told reporters. Archbishop Romero’s sainthood cause was opened at the Vatican in 1993, but was delayed for years as the Congregation for the Doctrine of the Faith studied his writings, amid wider debate over whether he had been killed for his faith or for political reasons. In 2013, Archbishop Vincenzo Paglia, president of the Pontifical Council for the Family and official promoter of Archbishop Romero’s sainthood cause, said the process had been “unblocked,” but gave no further details. Before the archbishop can be beatified, Pope Francis must either sign a decree recognizing him as a martyr or recognizing a miracle received through his intercession.